Included in this newsletter are some of our latest resources and tools, providing you with knowledge that's actionable, knowledge you can quickly incorporate into your projects, along with the latest industry news to see what others are doing. Thanks to our partners, J+J Flooring Group and Steelcase Health, the resources listed below are available free to all. Case Study: "Palomar Health Communicates Its Commitment to Patients Through 'Hospital of the Future'." Webinar: "Designing and Evaluating the Inpatient Room: An Evidence-Based Toolkit"
Blog: "Why Home is Where Good Health Is"
The resources and tools we provide are meant to be shared - make sure to pass them along to your team and as always, let me know what tools and resources have been helpful to you in the past, and we'll feature them in our future newsletters. In any given year, 1 in 68 Americans are diagnosed as having autism spectrum disorder (ASD), according to the Centers for Disease Control and Prevention. Many of these are young children who will face a lifetime of trying to acclimate to a world that will often seem hostile, if not dangerous and frightening. As the prevalence, awareness and diagnosis of autism have grown over the past 20 years, the design of new models for treatment has not kept pace. 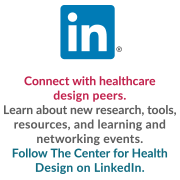 As healthcare designers, we believe that new and innovative architectural facility designs can significantly enhance the quality of treatment if these facilities are designed with the advance knowledge of how specific environmental factors affect the behavior and well-being of persons with ASD. Telemedicine appointments in the emergency department, nurses who visit patients in their homes after discharge, and patient-family councils who weigh in on potential improvement projects are just a few of the ways hospitals across the country are driving patient engagement. While healthcare organizations may take different approaches, they all share a common goal: to improve care by partnering with patients on healthcare options and treatment decisions. In an interview with Forbes, leading hospital CEOs discussed some of their strategies to better engage patients in their care. Fierce Healthcare, more . . The Hill-Burton Act was enacted in 1946 to increase the supply of hospital beds by providing construction grants to nonprofit entities. It was very successful: Between 1947 and, when funding ended in 1970, about a half-million additional hospital beds were added. What the act didn’t, and couldn’t, anticipate were medical advances that slowly rendered the Hill-Burton version of the inpatient hospital virtually obsolete. Hill-Burton hospitals were a major improvement over what existed: cottage hospitals and facilities with open wards, for example. Many of the new hospitals offered double-bedded rooms and better operating and diagnostic facilities. Medical Construction & Design , more . . . Hospitals across the country are moving into uncharted territory as healthcare delivery in the U.S. is being reinvented. Hospitals and patients have been affected by the new Affordable Care Act (ACA) healthcare reform that rolled out nationwide in 2012. Hospitals are now faced with shrinking reimbursements and patients are seeing high deductibles. Couple this with the rise in chronic conditions, which typically do not require overnight stays, but are based on long-term treatments, and we see a trend of empty patient beds, creating lower occupancy in many hospitals. These higher costs and low occupancy rates have forced healthcare facilities to rethink how healthcare is delivered in their community. Health-care facilities can be stressful places for patients and visitors, with depressing waiting rooms, rows of uncomfortable seating, a blaring television. But designers of some medical spaces are remedying the situation. A more holistic approach includes mood-elevating colors and artwork. Chairs are angled to look out the window. Screens offer calming nature scenes instead of newsfeeds. There's softer overhead lighting and skylights. Sometimes, diffusers even waft a gentle breeze of lavender or citrus to mask the harsh scents of disinfectants and medicines. T&D, more . . .
Make sure to Get Early Bird Savings for the 7th Annual Emergency Department Workshop! Join us for this seventh annual interactive, collaborative, problem-solving experience intended to enable Emergency Department professionals to employ proven physical design strategies and methodologies. At this two-day event you’ll learn how to evaluate those challenges and solve them using design innovations and facility based solutions. Taught by nationally recognized experts, this workshop uncovers and offers a review of design methodologies, benchmark challenges inherent in today’s emergency departments, how to quantify and measure those challenges and explore innovations, processes and facility-based solutions. You will obtain insight into optimal patient flow, research-based process, design interventions and strategies that improve clinical outcomes, quality of care, and patient safety and satisfaction. Stay tuned - more events to come! This blog explores how the value of taking a patient-centered approach to providing healthcare seems obvious. After all, the patient is the one who ultimately reaps the benefits of good health, so shouldn’t he or she also have the chance to take an active role in his treatment process, guiding his own outcomes?